Copyright © 2013 Shiwei Wang et al. This is an open access article distributed under the Creative Commons Attribution License, which permits unrestricted use, distribution, and reproduction in any medium, provided the original work is properly cited. A nitrile hydratase (NHase) hyper-producing Rhodococcus ruber strain LUV30-06 was bred by mutagenization on the starting strain CGMCC3090 with ultraviolet irradiation and lithium chloride. The NHase activity of the strain LUV30-06 was increased by 21.99% (3881.3 U/ml), as compared with that of R. ruber CGMCC3090 (3181.4 U/ml). The mutant strain UV30-06 has been proved genetically stable with higher NHase activity in seven successive subcultures as well as random amplified polymorphic DNA analysis (RAPD). The nitrile hydratase (NHase, EC 4.2.1.84) is a key enzyme involving in nitrile metabolism existing in many microbes. It catalyzes the hydration of nitriles to corresponding amides, and has been successfully adopted in chemical and medical industry for production of nicotinamide (NA), 5-cyanovaleramide and acrylamide . The strain of Rhodococcus. ruber CGMCC3090  was initially isolated from the soil samples polluted with nitrile compounds, it was capable of converting 3-cyanopyridine to NA with higher NHase activity (3181.4 U/ml). The NHase from R. ruber CGMCC3090 has high tolerance to its substrates such as 3-cyanopyridine and acrylonitrile. The strain has a broad substrate spectrum that formed by aliphatic, aromatic and heterocyclic (di) nitriles. It would have important industrial application value in case to improve the activity of NHase by mutagenizing on the strain CGMCC3090 with UV and Lithium chloride. The reports  showed that the conversion of 3cyanopyridine to NA catalysed by the enzyme from R. ruber CGMCC3090 did almost not generate any by-products such as nicotinic acid. Not only was NA used as feed additive [4,5], but also it had played an important role in the field of medicine. As vitamin PP, NA [6,7] was used to protect against “3 Ds” symptom including dermatitis, diarrh (o) ea and dementia, it was also used to treat skin diseases, e.g. skin whitening. Except for having radio sensitizing effect on tumor cells, NA [8-9] can induce GLC-82 lung carcinoma cell apoptosis and mitigate destruction effect of tumor necrosis factor alpha on fiber ring matrix and articular cartilage degeneration. As an important intermediate, the NA can also be used to synthesize other pharmaceuticals or pesticides. With few side effect and prospective market demand, NA  had very important value in the field of industry and medicine. It was necessary to screen and breed NHase hyper-producing strains using performable and effective mutagenic strategies from the starting strain of R. ruber CGMCC3090. In the present study, we report a NHase hyper-producing mutant of R. ruber strain LUV30-06 was obtained using the mutagens of ultraviolet irradiation and lithium chloride. Chemicals: 3-cyanopyridine and NA were purchased from Alfa-Aesar and both were analytical reagent grade. Marker (λDNA/Hind Ⅲ) and RAPD primers were obtained from the Sangon (Shanghai, China). Strains: R. ruber CGMCC3090 strain was conserved by the China General Microbiological Culture Collection Center. Media: agar medium, seed culture medium, and fermentation medium were prepared by using the methods  reported previously; Preliminary screening culture medium contained 16 g 3-cyanopyridine/L pH 7.2. All media were autoclaved at 121˚C for 30 min. Strains was streaked on the agar medium plate and cultured aerobically at 28˚C for 3 days. The fresh bacterial lawn was subcultured into the liquid seed media (50 mL) in a 250 mL Erlenmeyer flask and agitated at 180 rmp on a rotary platform at 28˚C for 72 h. A maximum density of ca. 5 × 108 cells/mL was estimated at its logarithmic phase. The seed culture solution of R. ruber CGMCC3090 at logarithmic phase was centrifuged in 1.5 ml centrifuge tubes at 5000 rmp for 15 min and the cell pellets were resuspended in 1.5 ml PBS buffer (25 mM/L, pH 7.2). The bacterial suspension was prepared with different dilution multiples (5, 25, 50, 100 and 200) of PBS buffer. The bacterial cells were counted using blood count plates, at the same time the unit concentration of R. ruber CGMCC3090 strains was calculated. The turbidity depending on R. ruber CGMCC3090 concentration was monitored by reading the optical density (OD) at 600 nm. So the standard curve drawing between concentration and turbidity of R. ruber CGMCC3090 was established. The actual dilution ratio and amount of the strains coating were decided in according to the standard curve. The seed broth was centrifuged at 6000 xg for 15 min, then the cell pellet was washed twice with PBS buffer (25 mM/L, pH 7.2) and resuspended in the same buffer. The prepared bacterial suspension was approximately 4.2 × 108 cells per milliliter. One millilitre seed inoculation of mutants (or the control) was transferred into 50 mL fermentation media in a 250 mL Erlenmeyer flask, agitated at 28˚C for 72 h. The fermentation solution was obtained. C, concentration of nicotinamide (mM/L); V, volume of reaction mixtures (L); v, volume of fomentation bacterial suspension (ml); a, dilution ratio; t, time of reaction (min). The 3 × 6 gradient seed plates were prepared with 3 parallel tests. The lithium chloride concentration gradient increased gradually (0%, 0.2%, 0.4%, 0.6%, 0.8% and 1.0%). The LiCl-free seed plates were used as controls. After the seed culture, the bacterial suspension was diluted certain folds according to the Standard Curve Drawing The diluted bacterial suspension (100 μl) was spread onto the solid seed media plates with different lithium chloride concentration gradients, at 28˚C for 64 hours in the dark. The colonies were counted and fatality percentages were calculated. After lithium chloride mutation, a better group plates from 3 parallel test groups was chosen. And 10% better colonies of total colonies on the chosen group plates were chosen at random and streaked individually onto the preliminary screening slants at 28˚C for 64 h. Eight better slants were selected from each lithium chloride gradient media, and then each of those selected slant stains was inoculated into a flask containing fermentation media, aerobically agitated at 28˚C for 72 h in a shaker. The activities of NHase produced by the mutants would be determined using HPLC. The mutants had the highest enzyme activity further used as the starting strain treated with ultraviolet irradiation (3 time parallel tests needed). 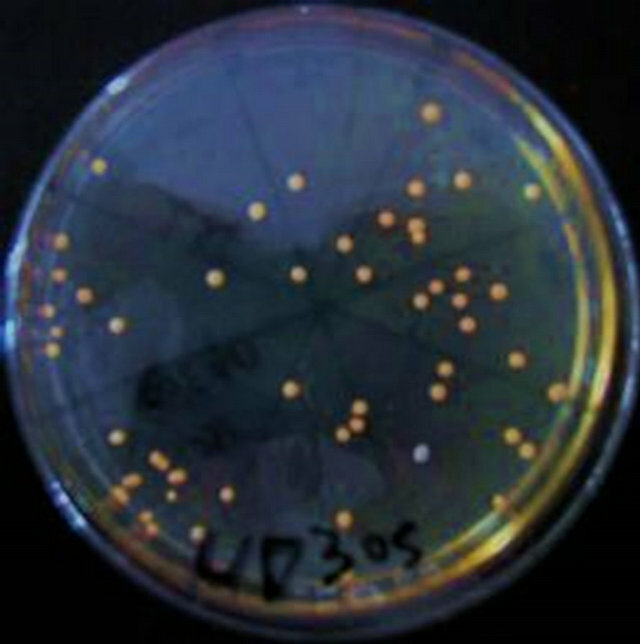 The colony of the highest NHase activity from LiCl mutagenesis was transferred into the seed media. After culture, the seed culture was prepared into the bacterial suspension and used as the starting strain. A UV lamp (30 W) was preheated for 20 min in a darkened room. Pipette 30 milliliters of bacterial suspension into the sterile petri dishes on a magnetic stirrer and exposed below the UVlamp with a irradiation distance of 30 cm. The irradiation time was 0 s, 15 s, 30 s, 45 s and 60 s respectively. Then, the bacterial suspension were placed in ice-box at 4˚C for 1 h, diluted 103 folds. The dilution (100 μl) was spread over the surface of the plate containing seed media individually in triplicates. At the same time, the original starting strain used as a control. The fatality percentage was calculated after incubation at 28˚C for 48 h. After the screening and rescreening (the method as the same as LiCl mutation), the mutants having the highest NHase activity were obtained and regarded as the ultimate goal strain for further studies. In order to analyze the genetic stability of NHase highproducing mutants, 7 successive subcultures were carried out. The activity of NHase of the mutants was analyzed in each subculture (3 times parallel tests needed). The DNA extraction from the strains and RAPD methods [14,15] were referred to the procedure reported before. According to Table 1, the standard curve was drawn with OD600 as the horizontal axis and the concentration of strains as vertical axis. A regression equation was established as y = 114.54 × 106x − 1.9211 (R² = 0.9977). It was satisfactory that the bacterial suspension was diluted 103 folds for the mutation and 100 μl of the strains coating was divided. Table 1. Correlation between concentration and turbidity. *Data were based on triplicates and shown as mean and standard error. The standard solutions of different NA concentrations (0.75 mM/L, 1.5 mM/L, 3 mM/L and 4.5 mM/L) were prepared. The peak areas of different standard NA solutions were detected by HPLC. According to the results showed in Table 2. The regression curve was established as y = 2951.3x (R² = 0.9504). Here, x is the concentration of nicotinamide (mM/L); y is the peak areas of nicotinamide. According to this equation, the nicotinamide concentration of a known peak could be calculated. Afterwards, the activities of the NHase produced by different mutants were calculated according to the NHase activity formula. 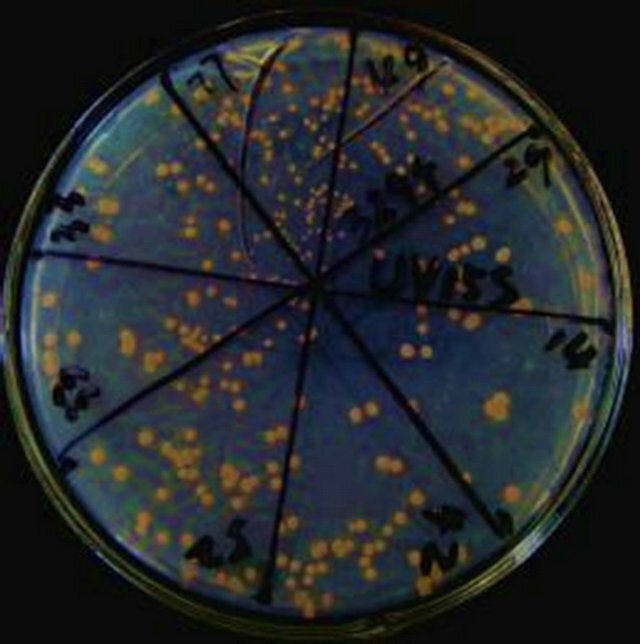 After treated with 0.2% LiCl, the colonies on the plate changed accordingly. Compared with the control, the sum of the colonies grow on the plate became less. The colony size maintained discordant. Treated with 0.4% LiCl, the different colonies dispersed on the plate with smaller colony size. 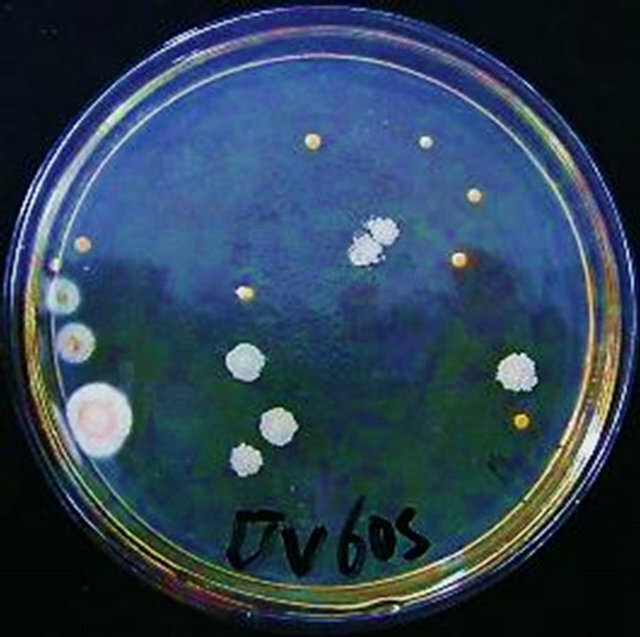 Mutated by 0.6% LiCl, the bacteria grew much slower and the colonies became less. With 0.8% LiCl treatment, the colonies decreased abruptly. Mutated by 1.0% LiCl, there were not any colonies growing on the plate. As shown in Table 3. The fatality percentages increased with increasing concentration of LiCl. Especially when the cells were treated with 1.0% LiCl, the fatality reached 100%. Table 2. Relationship between concentration and peak areas of nicotinamide. Table 3. LiCl mutation and fatality rate. *Data were based on triplicates and shown as mean standard error. There were approximately 900 single colonies in each group of repetition after LiCl mutation. Based on the growth status, 81 single colonies were chosen from a better group plate of 3 parallel test groups and cultured in preliminary screening slant media. In the compound sieve of mutants, according to its growth in preliminary screening slants, 32 good slant tubes were chosen (8 slants in each LiCl gradient). They were transferred into the fermentation media and put at 28˚C, 180 rpm, 72 h. The activity of the NHase was analyzed right after the culture completed (3 times parallel tests needed). The results showed that several mutants were positive; the most of other strains were stable or negative. Compared with NHase activity of the control (3181.4 U/ml), the mutant L08-03 had the maximum NHase activity (3557.1 U/ml). The NHase activity of strain L08-03 was increased by 11.81%. The strain L08-03 was used as the starting strain that was further subject to the compound mutagenesis. See Table 4. As the starting strain for compound mutation with UV, L08-03 was transferred into seed media. After seed culture, the bacterial suspension was prepared. Having been mutated by UV, the bacterial suspension was diluted 103 folds and was spread onto the seed media. After culture, many characteristics of the colonies have changed including the size, sum, and color (Figure 1). Figure 1. (a)-(d) Rhodococcus ruber CGMCC3090 UV-mutants. By 15 s UV mutation, the total number of colonies became less. 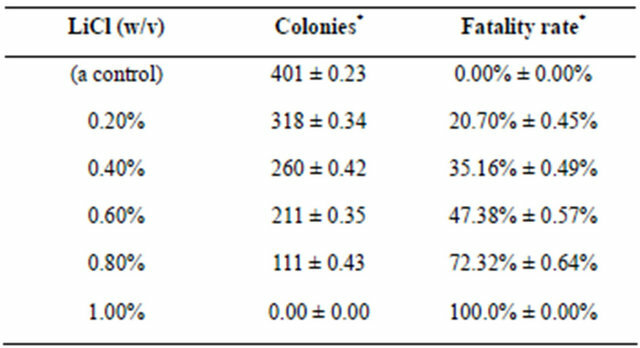 The size of colonies were not uniform (Figure 1(a)). With 30 s treatment of UV, The total number abruptly dropped off (Figure 1(b)). After 45 s ultraviolet irradiation, the sum of colonies got less. But in the case of colony morphologies, they were full, big and appeared bright in color (Figure 1(c)). Having been mutated for 60 s, the morphology of colonies changed obviously, dispersed and were not uniform, milky white. Some colonies had rough surface (Figure 1(d)). As showed in Table 5, the fatality percentage is 17.95% under 15 s mutation. But for 30 s mutation, it increased to 86.28% suddenly. The fatality percentages for 45 s and 60 s mutation were 93.52% and 95.76% respectively. After L08-03 mutated with UV, a group plates with good growth from 3 parallel experiment groups was chosen. From them, 10% strains (total 427 mutants) were chosen at random. These mutants were transferred into the preliminary screening media slants. According to the growth condition, 28 good strains were chosen in turn (7 strains each UV time gradient), followed by the seed culture and fermentation culture. The NHase activity was analyzed by HPLC. As shown in Table 6, the NHase activity of no mutants from 15 s Ultraviolet irradiation was more than that of the strain L08-03 (3557.1 U/ml). Fortunately, there were two mutants after UV irradiation for 30 s had higher activities than that of L08-03 strain. They were LUV30-01 (3861 U/ml) and LUV30-06 (3881 U/ml). The LUV45-03 and LUV60-02, also had higher activity of 3693 U/ml and 3628 U/ml respectively. So, they were used as the candidates for further experiments. As shown in in Table 7, according to the result of 7 successive subcultures, 5 strains with higher NHase activity were analyzed. L08-03 strain maintained stable NHase activity. For other 4 mutants, only LUV30-06 strain’s NHase activity remained higher and stable. Although LUV45-03 strain retained stability for four successive subcultures, its activity restored abruptly after that. The stable mutant L08-03, LUV30-06 were chosen and regarded as the goal strain for further studies. Table 4. The activity of mutants with LiCl (U/ml). Table 5. UV mutation and fatality percentages analyses. Table 6. 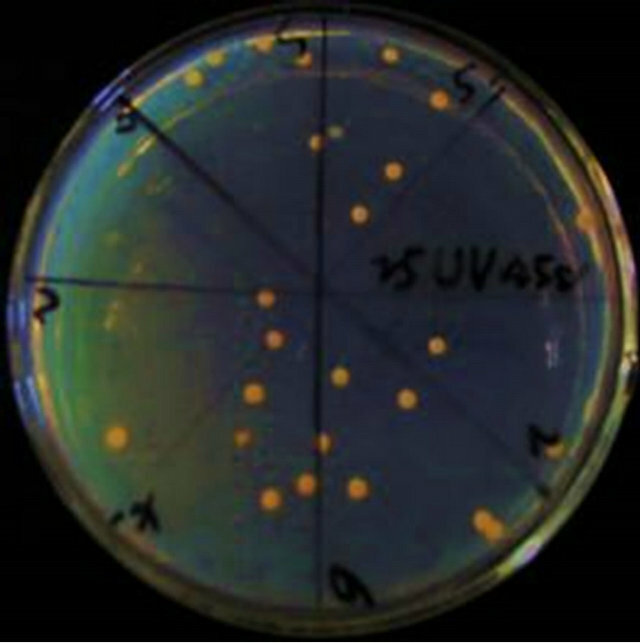 Activity of NHase of mutants with UV mutation (U/mL). Table 7. Stability of NHase high-yield mutants. Figure 2. (a)-(c) Results of random amplified polymorphic DNA. *Lane a1 was loaded with the PCR produces from DNA template of L08-03 strain; Lane a2 was loaded that of R. ruber CGMCC3090. PCR primer is s65; Lane b1 was loaded with the produce of RAPD with LUV30-06; Lane b2 was for that of L08-03 using s7 primer; Lane c1 was loaded with the produce of RAPD from LUV30-06 strain; and Lane c2 for that of R. ruber CGMCC3090 using s22 primer. M stands for Marker. obvious polymorphisms, namely s7, s22 and s65. The RAPD reactions were carried out using the 3 primers. As shown in Figure 2(a), the RADP had distinct hereditary polymorphism. There was a very bright band between 125 bp and 564 bp in Lane a1, but there had not similar band in Lane a2. This proves that there were genetic differences between L08-03 and R. ruber CGMCC- 3090. As shown in Figure 2(b), using s7 primer, and obvious polymorphism bands were amplified. Above 125 bp in Lane b1, a band was obvious, but absent in Lane b2. It was very possible that these genome differences due to the compound mutation using LiCl and Ultraviolet radiation. The external performances that LUV30-06 strain produced high activity of NHase resulted from these internal mutation in the genome. As shown in Figure 2(c), by using s22 primer, a beautiful result of RAPD marker had been obtained. Compared with Marker, there were at least 3 unique bands on top of 564 bp in Lane c1, furthermore, under 125 bp, many similar bands in Lane c1 were brighter than those in Lane c2. All of these differences reflected genetic variations among LUV30-06, L08-03 and R. ruber CGMCC3090. On the other hand, other 52 primers had not got obvious different RAPD mappings. The results showed that Both of LUV30-06 and L08-03 derived from R. ruber CGMCC3090 with very analogous genomes. The genus Rhodococcus  was found in 1891 by Zopf with more than 40 species at present. An interesting strain from Rhodococcus that biodegraded 3-cyanopyridine in the polluted waters was reported by Kobayashi and Shimizu  in 1998. LUV30-06 was successfully screened out. Its activity of NHase reached 3880.3 U/mL. There are few reports of screening the high-yield NHase strains by compound mutation at present. Zhu  reported that a stable high-yield NHase strain Rhodococcus sp. HUST-1 obtained using compound mutation with ultraviolet and diethyl sulfate mutation. Zhou  also reported that Nocardia sp. DT7879 was obtained from Nocardia sp. DT06 by microwave and chemical mutagen A. After 7 successive subcultures, the L8-03 strain and LUV30-06 strain NHase productivity still remained stable. The RAPD results further proved that Although L8-03 strain and LUV30-06 strain had obvious genetic variations; both of them came from R. ruber CGMCC3090. Without doubt, LUV30-06 strain not only can be used as the NA producing strains but also will confer profits to the development of pharmaceutical intermediates and environmental protection. Wang, S.W. and Wang, M. (2011) Research process on microbial diversity of producing NHase and study on NHase. China Biotechnology, 31, 117-132. Zhang, J.L., Wang, M., Sun, H., et al. (2009) Isolation and characterization of Rhodococcus ruber CGMCC3090 that hydrolyzes aliphatic, aromatic and heterocyclic nitriles. African Journal of Biotechnology, 8, 5467-5475. Guiot, P., Ryan, M.A. and Scriven, E.F.V. (1996) Preparations and applications of nicotinic acid and nicotinamide. Chimica Oggi (Chemistry Today), 14, 55-57. Xin, J. and Hu, B. (1992) Nicotinamide radiosensitizing effect and its clinical application. International Journal of Radiation Medicine and Nuclear Medicine, 16, 200-203. Guo, J.L., Shen, H. and Li, Q. (2008) In vitro effect of nicotinamide of GLC-82 human lung adenocarcinoma cells. Guangdong Medical Journal, 29, 209-211. Song, Y., Zhong, L.P. and Wang, M. (2009) Effect of metal ions on Rhodococcus sp. nitrile hydratase activity. Journal of Tianjing University of Science & Technology, 24, 11-14. Prasad, S., Raj, J. and Bhalla, T.C. (2004) Optimization of culture conditions for hyper production of nitrile hydratase of Rhodococcus rhodochrous PA-34. Indian Journal of Microbiology, 44, 251-256. Li, X.D., Wang, M., Zheng, Y., et al. (2010) Optimization of conditions for the biotransformation of 5-cyanovaleramide from adiponitrile by Rhodococcus ruber CGMCC- 3090. 4th International Conference on Bioinformatics and Biomedical Engineering (iCBBE), Chengdu, 18-20 June 2010, 1-4. Wang, W.S., Dong, Y., Li, T., et al. (2006) The method of DNA effective and quick means for DNA extraction of Taxol producing fungi. Journal of Science of Teachers’ College and University, 1, 60-64. Hua, J.G. and Guo, J.H. (2003) The axonomy and application Rhodococcus. Microbiology, 30, 107-111. Zhu, T.T., Qin, Z., Sun, X.J., et al. (2009) Breeding of high-yield strain of nitrile hydratase by compound mutation. Journal of Anhui Agricultural Sciences, 37, 1397- 399. Zhou, Y.X., Wu, J.H., Li, H.M., et al. (2008) Study on mutation and breeding of nitrile hydratase producing strain and optimization of its fermentation condition. Chemistry & Bioengineering, 25, 46-49.